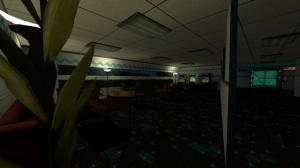 For the first day of Zombie Panic: Source week we will be having a look a the custom map; zpo_aquatica. This map caught my attention when it came up on a server I was playing on recently. I was really impressed by the distinct quality of the map and some of the unique features in it. For one, maps with underwater parts are not easy to do on the Source Engine, however this one managed to make it work. 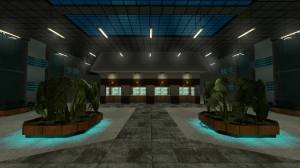 Featuring slick map design, some custom elements and very fun gameplay, this is a must play for any Zombie Panic: Source fans. The latest version having been released only a month ago, the map was updated with one new feature that caught my attention. If the humans win too many games then the game will decide to help the zombies. It will do this by stopping the elevators at the beginning half way allowing the zombies easy access to the human players. It happened when I was playing and while we were momentarily confused, everyone enjoyed it and got a good laugh out of it. GET TO THE LIFTS, GET TO THE LIFTS! I really liked the concept behind this map, I’m an absolute sucker for any Source maps that use a lot of water effectively and this map certainly did. The Source Engine’s water system can be really difficult to work with, especially when working underwater. 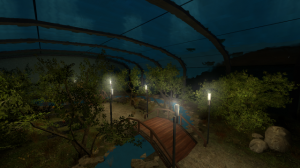 I couldn’t tell you how the creator pulled off the effect but I imagine he supplemented the water with several Source Engine effects and smart texture placement to avoid the many problems that come when trying to build an aquarium with the water system in the Source Engine. The gameplay itself is enjoyable, from the frantic beginning where zombies pour in from the roof as the humans desperately try to get in a lift. 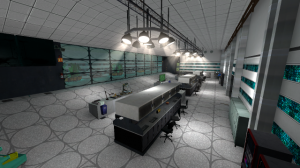 Then the mad rush through the underwater facility to find the documents before the zombies do. All the while people are being picked off and the human team is getting weaker and running out of ammo. Assuming you’ve completed all the goals within the complex you still have to make your way out of it and get to the boat. That means going back to the lifts and getting to the boat. 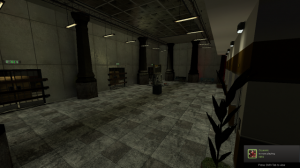 The zombies are still coming at you and you have one new problem to contend with, the water is rising in the facility. I was an unfortunate victim of the flood and I must say when I realized what was happening my heart sank. I had been so close to surviving. That last part really caught me, a surprising twist to an exciting map. 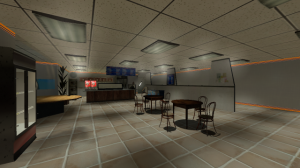 In conclusion this map is by far one of the best Zombie Panic: Source maps I’ve played so far. It contains all the necessary features to make a ZPO map enjoyable while be visually appealing. Keep in mind that I’ve not played that many Zombie Panic: Source maps yet but I doubt many maps could top this kind of quality. You can have a look at the forum thread here and download the map here.